Elena and I are on week three of “The Weekender”, which is a three times weekly subscription to the New York Times. The paper arrives in our foyer on Friday, Saturday and Sunday mornings, and–because we are the only people in the 10 unit building we live in to get the paper delivered–there’s never any confusion as to which one is ours. Although I always grew up with the newspaper around, this has been my first experience as an actual paying newspaper subscriber, and I’m really enjoying it! The ritual of grabbing it on the way to the subway on Friday mornings has been particularly joyful. After reading what interests me on the front page, I quickly jump to page two and read one of my favorite sections: the “Corrections”. There’s something really captivating about these short paragraphs. (There were 10 of them this morning: a really high number methinks!) The writing is so calculated, and thorough, and the corrections themselves are usually fairly entertaining. Aside from correcting errors from previous papers, they also serve as a sort of apology to the (hopefully) small handful of people likely offended by the indiscretion. And it almost goes without saying that corrections provide good reading and the occasional laugh. There were no grammatical errors to correct in this morning’s paper. Nearly all of them were minor legal or statistical changes, or name misspellings. And in a few cases, the Times had simply gotten people confused, an error that I’d hope a professional fact-checker or copy-editor would have caught before printing. 1) It’s hysterical! Just the phrase “misidentified one of the Yankees shown getting creamed” is worth repeating. 2) The description is truly meticulous. The correction writer sets the scene, describes the reason for the creaming, briefly notes that it is a relatively new phenomenon among Yankee post-game celebrations, and even makes sure to point out that the projectile in question was not a genuine pie and was instead “something resembling a cream pie”. 3) The misstated name is, by itself, memorable: 18 letters in all and the last 10 of them spell Albaladejo. Miranda, Albaladejo, and the "pie" in question. I can understand not being able to verify Miranda's face, as its covered in "pie" and as his jersey number is not visible, but Albaladejo is clearly standing right behind him. Come on now, factcheckers! Earn your keep! An article on Monday about Brandon Jennings’s season thus far as an N.B.A. Rookie with the Milwaukee Bucks referred incorrectly to a Ferrari driven by one of his teammates. It belonged to Bucks guard Michael Redd; it was not center Andrew Bogut’s car. 1) I love the semi-colon usage; it was perfectly suited to describe the situation. 2) I do have to partially retract my previous statement about the meticulousness of the Times’ corrections writers. The Bucks season starts this evening, four days after this piece appeared. Therefore to refer to the article as being about his season thus far was incorrect, insofar as the season hadn’t started yet. Sweet Jesus, yes they can! (I litereally just discovered that now, hidden in a tiny little link all the way at the bottom of the main page.) There are even links to the actual articles. Bring it on, internet! Rant rescinded. Click on the picture! It's a time machine! Los Bulls? Are they serious? Derrick Rose, sporting the Los Bulls jersey in a game versus the Miami Heat last season. The 2009 season will mark the second consecutive year that a handful of teams in the NBA will honor their Hispanic fan base by donning Spanish language jerseys. A few baseball teams established this great idea before the NBA got in on the act. Personally, I think its a nifty idea, even if the cynic in me assumes that (like any alternate jersey), the primary reason for these nights is to boost jersey sales. However, I think these jerseys may seem a little less patronizing if they actually translated the team mascots. “Los Bulls” sounds like Chris Farley in SNL translating “El Nino” as “The Nino” a few years back. And while that joke is mildly amusing, I doubt the NBA was aiming for something more significant than an unoriginal SNL joke. 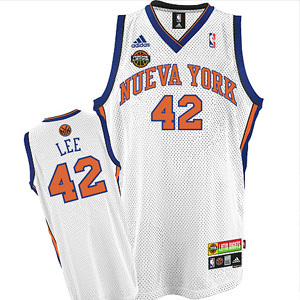 What they were really after was a tribute to Hispanic players in the NBA and to the latino fans of NBA basketball. I mean seriously: “Los Bulls”? Although “El Heat”, “Los Rockets”, “Los Mavs”, “Los Suns”, and the “Nueva York” Knicks (which, of the group, makes the most sense) are also getting in on the act, I’m using the example of Los Bulls to illustrate the linguistic problems with these jerseys. First of all, in English there are never definite articles in front of team mascots on jerseys. The Mets, even if they are referred to as “The Mets”, never put both words on their jerseys. It would look phenomenally silly and aesthetically cumbersome. Can you imagine a jersey that says “The Diamondbacks”? That’s simply too may letters. As it stands, the team rarely even uses the entire word, instead using jerseys that say “D-Backs”, which from a distance can be a little problematic for obvious reasons (think “g” instead of “ck”). At any rate, simply on those grounds, the “Los” in Los Bulls makes no sense. The second and more important issue is the laziness involved in not bothering to translate the mascot? When the the Giants and Brewers do this in baseball, they use “Gigantes” and “Cerveceros” respectively: creating jerseys that are just as freaking sweet as they are thoughtful. Brewers shortstop JJ Hardy sporting the "Cerveceros" jerseys. The San Francisco Giants wear "Gigantes" jerseys for the same event. In the case of the Bulls (or the Heat or the Suns, etc) there exists a straightforward translation. In the case of the Bulls, its Toros. Its simple, would look elegant on a jersey, and would actually look like serious tribute to Latino players and fans, not just something an unpaid intern came up with between goggle-chat marathons. It would be one thing for a team to not do this if their mascot was not as easily translatable. The Astros, for example, is practically a made-up word. No simple translation exists for it in Spanish as far as I know. However, I am confident that there are possible Spanish translations for teams like the Suns and the Heat, and, as I’ve said before, definitely the Bulls. Hopefully, in coming seasons, the NBA will class up its act and follow suit, but for now, its just bewildering and strange to envision Eduardo Najera wearing a jersey that says “Los Nets”. In the meantime, if anyone would care to enlighten me as to the NBA’s rationale for these decisions, I’d love to hear it. Seriously, I would. Given the way that ESPN Deportes lists MLB teams translated but keeps all NBA teams in English, I’m assuming there’s some lame legal explaination behind it, but that would just be speculation. For now, I’m pining for the day that I can buy my very own Milwaukee Venados jersey (a guess, by the way, with the help of the internet). Somewhere along the Williamsburg Bridge. I have no recollection of taking this photograph. Now that the weather has begun to turn, and the longest winter in recent memory is receding in the rear-view, I’ve begun walking places again. I’ve resumed my semi-regular walk home from work: a constantly evolving, jagged path through the fire-escape-gilded Lower East Side and the pungent lanes of Chinatown. Aside from the sidelines–Broadway to the west, and the Co-op (balcony-clad) and NYCHA (balcony-less) towers to the east–no street is safe. Anything in between is in-bounds. A couple weekends ago, I offered to bring a case of Brooklyn IPA to an afternoon of watching baseball in the vicinity of Gramercy Park. Ordinarily, the trek to the Brooklyn Brewery involves the L-Train, but I decided to walk instead. Having never walked across the Williamsburg Bridge, I headed straight down Avenue D (and then Columbia, as I crossed Houston). After I realized that I couldn’t access the bridge at Columbia and Delancey, but before I started to backtrack west, I ran into something that reminded me of Iowa: Masaryk Towers. Tomas Masaryk, first President of Czechosolvakia, and father of the victim of the Third Defenestration of Prague. I spent the fall of my third year at Grinnell in the Czech Republic, and during my senior year I studied Jan’s father’s personal and literary relationship with Karel Capek, for whom this blog is named. 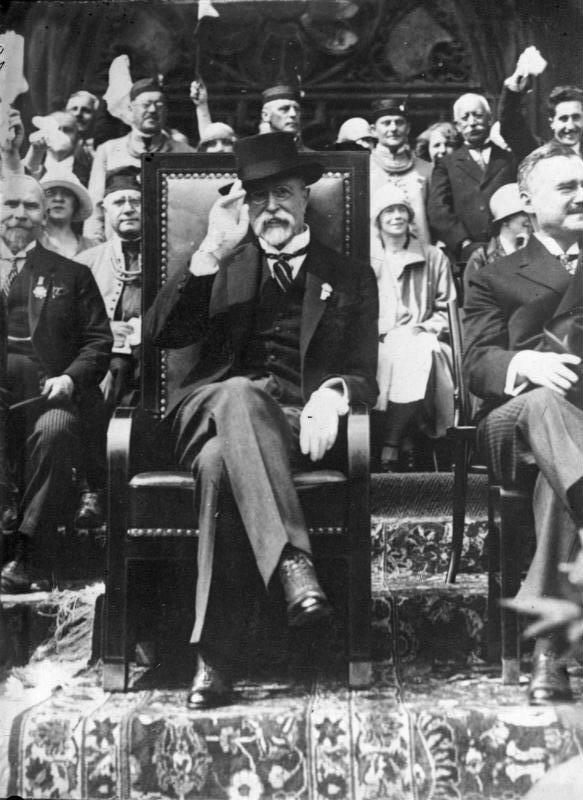 Tomas G. Masaryk, a philosophy professor turned politician, led the exiled Czechoslovak army (literally) around the world during the First World War. After the War he became the country’s first president, and was a strong crusader for small nations during the inter-war years. Masaryk’s story and his writings are fascinating, and I would recommend “The World Revolution” (translated meekly in English as “The Making of a State”) to anyone with an interest in European history. Back in New York, I rounded the corner of Columbia and Delancey, and headed west until I hit the bridge. Of the three East River bridges I’ve crossed, the Williamsburg Bridge may be the most visually interesting. And, like the elegant Brooklyn Bridge, it is most striking in that it reflects the character of the neighborhood you’re traveling to (that is, if you’re coming from Manhattan). All gray steel and rivets, save the red stripe elevating pedestrians and cyclists above the roadway, the bridge is mesmerizing and beautiful and repetitive, while at the same time transparently functional. Nothing is showy; there is no artistic stonework; and the girders themselves are straight and simple, unlike the curved and stylized metalwork of the Manhattan Bridge. As the cables between the towers began to rise in front of me, and as the slope of the bridge began to tilt Brooklyn-ward, I was reminded that my comparison between the bridge and Williamsburg itself was fragile and tenuous. On the south side of the bridge, uninteresting condominium towers jutted upward from what was once a completely industrial area, and much of the industrial buildings that have been left standing have long since become residential. I like Williamsburg, and I like to an extent what it has become, but after two years studying cities and Urban Planning, there is one constant despite the chaos and diversity of American cities that is nearly universal. Once manufacturing areas are rezoned and turned to residential, they never go back. Jobs may be lost for residences, but residences are never lost for jobs. And in a society that requires vapid consumption just to survive economically (as we’ve seen recently with the demise of Circut City, Chrysler, and, (*gasp*) even the strategic shrinking of Starbucks), the permanent loss of manufacturing and industrial infrastructure in favor of residential development in communities like Williamsburg, Willets Point and Red Hook is a historic act whose reprocussions will be far reaching, and, most likely, irreversible. These were the sorts of thoughts in my head as I got off the bridge and walked north on Berry towards the Brooklyn Brewery. But to finish my story, I made it to the Brewery, had a Blast! (the beer) while reading Lush Life (Richard Price’s most recent novel), and trudged back to Manhattan and up First Avenue to my destination: this time with a case of beer in hand. Thankfully for my back and my arms, I took the L-Train. Around the corner from the Brooklyn Brewery: Silly, I know, but really well done! One of my better (part-vegan) breakfasts. Before anyone jumps to any rash conclusions, I’d just like to preemptively announce that, in terms of food, I’m like Chipper Jones–a great switch hitter, with power from both sides of the plate. Okay, for those of y’all who are not baseball fans, I probably should offer a more comprehensive explanation. I grew up alternating between farm and city, and when I was on a farm, I was exposed at a very young age to the “potential” (or from my perspective: “self-evident reality”) of the humane treatment of livestock in small scale agriculture. Between the farm that we lived on and the farm that my father was raised on, we raised shorthorn beef cattle and excellent chickens (for both eggs and meat), as well as a couple goats (as pets and as weed control). As a result, I am most definitely an appreciator of all products animal. However, after spending a few weeks in Indonesia (and spending a lot more time with a seriously indefatigable vegetarian), I really began to appreciate the methods and ingredients of serious vegetarian cuisine. This has resulted in a kitchen where we cook with far more tempeh than bacon, and more soymilk (always unsweetened!) than whole milk: though I try to keep both on hand. In short, I love cooking both meat and vegetarian food, and I see no reason why one must pick one or the other. Why have both soymilk and cow’s milk, you ask? Its simple: each milk has its pros and cons depending on the situation. Regular milk is much better for baking, in coffee (most of the time), and for use in egg-based dishes. However, there’s nothing better with oatmeal (in my opinion) than the nutty richness that is soymilk. But I digress. This post is about breakfast, and its about time I started writing about it, because it was ungodly delicious! Like most of my breakfasts, this one was spontaneous. I woke up with two thoughts in my head: fried eggs and cornbread. A good, simple combination methinks…but after a half-cup of coffee, I got ambitious. My first big idea came quickly: poached eggs. I had a pretty good aged cheddar on hand, and was running low on butter–butter than I would need for “skillet-ing” (*see note) the cornbread . I could survive without the butter by poaching the eggs, and the cheese would make a good topping paired with the cornbread. By this time I was moving in a more southern direction. I had thrown a couple tablespoons of Spice House chili powder (if you’ve ever had Spice House spices, you’ll understand why I bothered to mention the brand!) into the cornbread batter, as well as a bit of cayenne and dried parsley. And it was then that I had a second idea: hollandaise. I’ve never made a hollandaise before and despite my now cup and a half of coffee I wasn’t ready to go down that path this early in the morning. I had seen an episode of The French Chef with Julia Child where she made one from scratch, and all that I can remember is a lot of butter, egg yolks and cream. Regardless, I was out of butter–having used the last of it to prep the skillet for cornbread–and all I had on hand was soymilk: not good for this purpose. So that was a dead end. Back at square one, I saw a can of pintos in the cabinet, and thought: “this could work.” I already had a southern theme going on, so I could just mince up some shallots and garlic, and saute them with the beans and a few spices; that could make a nice pinto bean topping for the eggs. So, I’m poaching the eggs (farmers market: the yolks are almost orange they’re so good! ), the cornbread is just starting to brown in the oven, and the beans are tasting good, but they’re just beans: uninspiring, and not at all saucy (I was still pining for a hollandaise at this point). And then I remembered an amazing fact: I own an immersion blender! Let me repeat that: I own an immersion blender! Yes! I grabbed the blender, added a touch of water to the beans, and blended the pintos right in the saucepan until they were a rich, creamy sauce. Let’s call it a vegan pinto hollandaise. Brilliant! So I cut the cornbread into wedges, split it, put the pieces crust-side down, added a layer of the cheese, two poached eggs, and literally covered the whole thing with the pinto-hollandaise. My god, was it tasty! My only regret is that I didn’t take a picture. If this sounds a bit dramatic, believe me it was! So if you’ve got a blender, I’d recommend making this yourself, as soon as possible. And when you’re baking cornbread, the simpler the recipe the better: so long as cornmeal makes up at least half of the ingredients. This is not the time or the place for cakey cornbread! Finally, be sure to get your timing down right. Poached eggs can really get overdone quickly, and cornbread must be served immediately. It’ll start to loose moisture as soon as it leaves the oven. So get some boiling water ready for the eggs, but don’t poach them until just before the cornbread is done! *Note: “Skillet-ing” is a phrase that I use to describe the process of prepping your cast-iron skillet for baking proper cornbread, and yes you need a well seasoned cast-iron skillet. First of all, your skillet should be hot. Put it in the oven for a couple minutes. You don’t want it blazing hot. Just hot enough for a tablespoon or so of butter to immediately start to melt and sizzle (but not brown). See where I’m going with this? Yeah, I thought so. Pull the skillet out of the oven and drop a tablespoon of butter or so (maybe a little less) into the center. And put the skillet back in the oven to let the butter melt. Then pour the cornbread batter into the skillet and throw it into the oven. Pouring it into an already heated skillet with the melted butter makes all the difference, I promise! I won’t have too many baseball posts on this blog, but I do have a fondness for readable sports journalism, especially when the subject is my beloved Milwaukee Brewers. Tom Friend, a writer for ESPN The Magazine, wrote this article about the demise of the San Diego Padres at the hands of the recently-eliminated Brewers, specifically focusing on the at bat when, Tony Gwynn Jr., son and namesake of the most popular player in Padres’ history, tied the game that the Padres needed to win to secure a playoff berth: in the bottom of the ninth, with a two-strike count, against one of the game’s greatest closers. He did it with a triple. 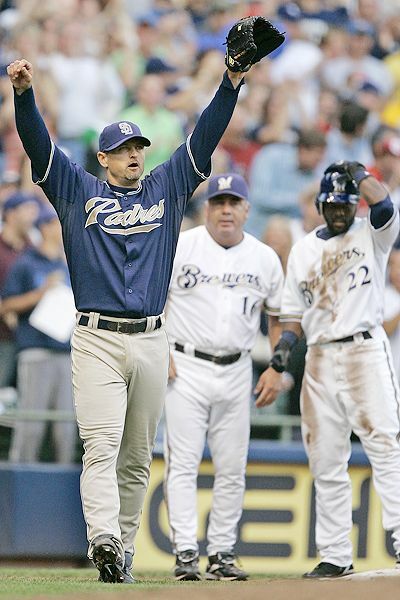 The Brew Crew went on to win the game, and the next one, forcing the Padres to play a one-game playoff against the Colorado Rockies, a game they lost in extra innings thanks to another Hoffman collapse.